The area of Reliability has become a very important and active area of research. This is clearly evident from the large body of literature that has been developed in the form of books, volumes and research papers since 1988 when the previous Handbook of Statistics on this area was prepared by P.R. Krishnaiah and C.R. Rao. 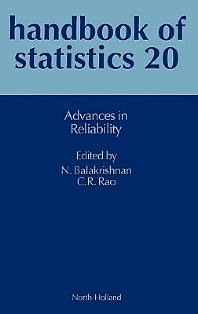 This is the reason we felt that this is indeed the right time to dedicate another volume in the Handbook of Statistics series to highlight some recent advances in the area of Reliability. With this purpose in mind, we solicited articles from leading experts working in the area of Reliability from both academia and industry. This, in our opinion, has resulted in a volume with a nice blend of articles (33 in total) dealing with theoretical, methodological and applied issues in Reliability.